Broccoli Soup Recipe - Broccoli soup is a American cuisine. This healthy soup recipe is done using broccoli and other leafy veggies.It is a Rich in vitamins and nutrients and can fight cancer cells, control blood pressure, reduce cholesterol and improve the nervous system.There are lot of benefits of Broccoli Soup and you can add this in your salad works well with all way to have. This is perfect recipe for who want to loss weight.This is easy to prepare at home with few simple steps. Step 1 : Cut the broccoli pieces in small size and wash them in running water.Boil water in pan and add 2 teaspoon salt in water.When water boiling then add all broccoli pieces in Boiling water for a minutes.Turn of the flame and leave broccoli in hot water for 5 minutes. Step 2 : Wash tomatoes and cut into large pieces.Peel the stalk of broccoli and chop finely. Peel ginger and make small pieces or you can Ginger paste . Step 4 : Now check the broccoli stalks become soft, if not, then cover and cook for 2-3 minutes. Turn of the flame. When cooled, Grind the Broccoli stalks, Spinach,tomatoes ,masala and half boiled broccoli pieces in a jar and make a fine paste. Step 5 : Put the broccoli Paste in the pan, mix 4 cups of Veg stock water and salt according to the taste.Add Cream and Boil the soup for 4-5 minutes.Turn of the flame. Finally : Transfer to serving bowls,Broccoli Soup is ready. 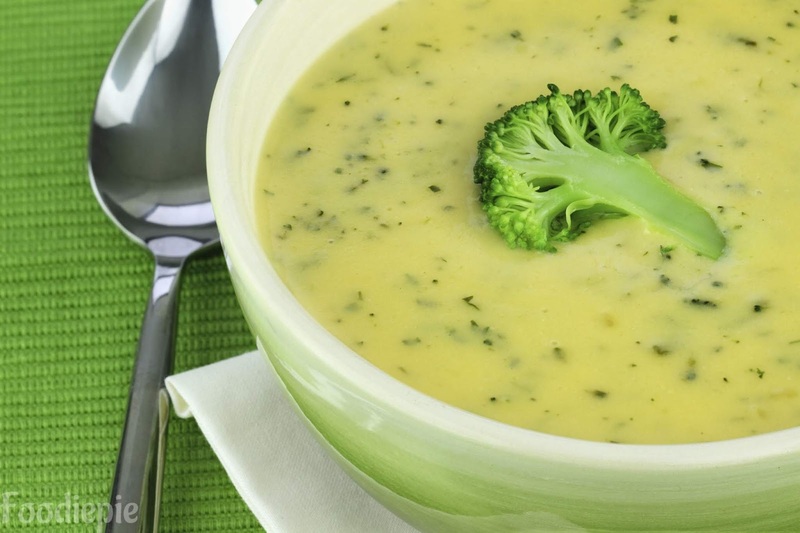 serve hot healthy Broccoli soup.